It was a busy April 2012! Friend event: Wild & Scenic Movie and more -4/17 Hinds Center, WCU. Organized by the Tuckaseigee Chapter of the Alliance, WNCA, this event featured a great sequence of short, poignant films about a range of environmental problems and solutions that directly or indirectly touch us here in Western North Carolina. Hats off to ‘Becca Berrgen and Ken Brown for organizing this event! Our director, Roger, spoke about the clean water — fouled “I was so impressed by the plastic bottle film and the plastic bag film, too,” according to our director Roger Clapp. He spoke at one of the breaks between films. Tom Bolt, professor of Cherokee Studies, delivered a challenging talk describing the Cherokee vision of our land and landscape. Green Fire — Thurs. 4/19 7:00-8:30, free. Smoky Mountain Community Theater, Bryson City. Must-See conservation film. The life and legacy of Aldo Leopold – creator of the discipline of wildlife ecology and visionary. Janice Inabinett was the lead organizeer. Special thanks go to her, and panelists Susan Sachs (GSMNP education coordinator, Blair Allman (Leader, Swain High Env. Awareness Committee), Robert Hawk (Coop. Ext. Service agent – Swain & Jackson), and WATR’s Roger Clapp. See blog! The theme of “a land ethic” resonates in our region — a compeling and challenging response to property rights. April 19, 2012 1-4 P.M.
Meeting Place: C.J. Harris Boat Launch — high water; called off. Saturday April 21, 2012 9-11:30 A.M.
Greening Up The Mountains. Sat. 4/28 from 10-5 pm. Main Street, Sylva. WATR’s pavillion theme will be “The Creek is Alive” complete with macro invertebrate sorting. Bring a kid who can earn a hands-on micro degree in Water Bugology! Mandi Carringer did a superb job of showing off stream bugs caught hours earlier in Scotts Creek to kids and a few curious adults. Over 60 folks signed in — a GUTM record for WATR. A record 31 contractors & excavators turned up for this training. Goal of this training was to show WHY erosion control is so important for a healthy biological community in our creeks. The lesson was a repeat of our “The Creek is Alive!” presentation, adapted for the front-end loader crowd. Evaluation was our best ever with ratings of 5’s (the best) interspersed with just a few 4’s. As clay is to the potter and stone is to the sculptor, river cane is the vital raw material to the Cherokee basketmaker. But it’s in short supply. Macon County’s commissioners want their planning board, if possible, to finish up work on a steep-slope ordinance. This after what Planning Board Chairman Lewis Penland wearily described as a long few weeks, in which members have drawn the ire and criticism of local anti-planning advocates. Members of the Alarka Creek Properties Homeowners Association have won a $3 million lawsuit over roads that deteriorated in the subdivision. The court accepted the property owners’ claims that the roads were shoddily built on too-steep terrain and that the developer ignored appropriate erosion control measures. for the endangered Appalachian elktoe mussel. 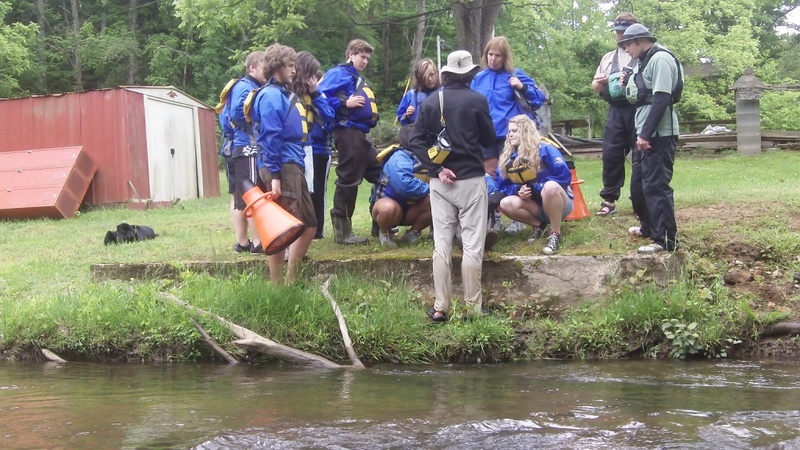 Environmentally Aware Club from searching for the endangered Appalachian elktoe mussel in theTuckasegeeRiver. On Tuesday, May 17, eleven members of the club traveled upstream of Dillsboro to start their search. Under the guidance of Gary Peeples, outreach coordinator for the U.S. Fish & Wildlife Service, they used underwater view scopes to search the river bottom and try to locate the endangered animal. The original plan was for the club to raft down the river and stop at various points to look for the mussel. With the bad weather, the group searched for mussels once and then rafted straight down to the take out point. According to Roger Clapp, director of the Watershed Association of the Tuckasegee River, “Mussels belong to a group of animals called mollusks, and they look like salt-water clams. They continuously filter stream water, and in the process they take out silts and clays and contaminants, thus improving water quality. Problems arise when there is too much silt and clay, and these sedentary animals get covered then smothered with sediments, and eventually they die. Paige Tester, club president, said “I was surprised we found many more shells of the Asian clam than those of the Appalachian elktoe. The Asian clam is an invasive species that should not be here. So we have too many of the non-native kind of mussel and not enough of good mussel.” She also commented on the bare-soil banks along the parts of the river which contribute unwanted sediment to the creek, probably being one cause of the decline of the Appalachian elktoe. “There was also the problem of trash in the river; it was everywhere,” said Tester. For many, the trip was a new adventure. PJ Sweet said, “It was just fun getting into the fisherman’s waders and searching the river bottom with the view scopes. We found many shells from the Asian Clam.” Tyler Willis found the lone example of the endangered mussel that day. With cold weather, no one wanted to stop and do more exploring. Instead, the whole group rafted the two miles down to the waiting cars. The rafts were provided free of charge by Willdwater. Kevin Gibbs and Matt Cook, Wildwater guides, volunteered their time. Monica Fortner said she enjoyed getting their raft stuck and then unstuck on the river rocks. Many were amused when Clapp, the trip organizer, flipped his canoe. Others in the group were Jonah Winchester, Morgan Green, Marley Simmons, Blair Allman, Athena Arkansas, George Helmer, and Kaitlin Roberts, and Ms. Anne Watkins, the club’s faculty advisor. Partway down the river, Dr. Karen Kandl, a Western Carolina University biology instructor joined the group. She has extensive experience with freshwater mussels. A chilled, but more ecologically informed group of students agreed that this hands-on search for an endangered animal was a worthwhile adventure. And they might like to extend the investigation next year. There may be a real possibility for more involvement. WATR recently submitted a proposal to the NC Wildlife Resource Commission. Among several tasks, a start-up initiative in mussel monitoring, to be led by Dr. Kandl, is called for in the application. 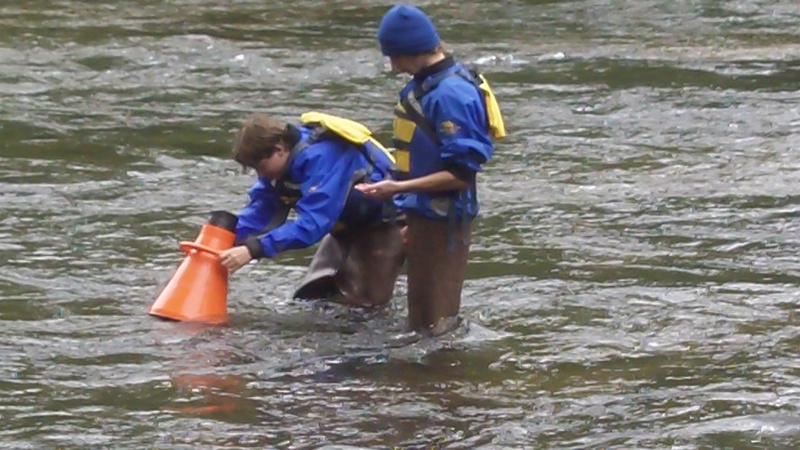 If the proposal is accepted, students, as well as parents and other adults, could participate in science and help protect our aquatic resources. Contact the WATR office at 828-488-8418 if you are interested. 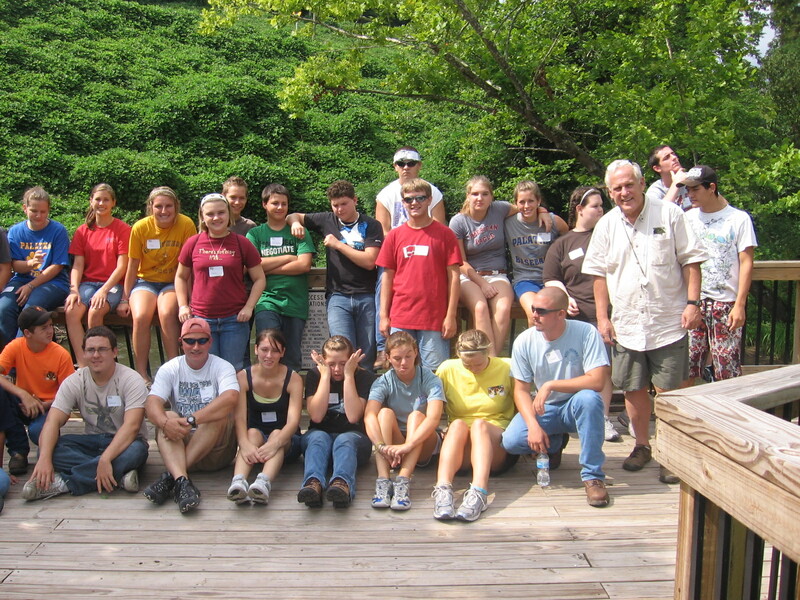 WATR’s involvement in the field trip was supported by a grant from the Cherokee Preservation Foundation. This gaggle of girls were among the volunteers from Francis Baptist Church that helped to install the first set of stairs for the Buffer Trail at Monteith Farmstead Park last summer. The whole group from the Francis Baptist Church of Palatka, Florida. will be funded by Resourceful Communities, a program of The Conservation Fund headquartered in Chapel Hill.